I may actually have one more finish before the end of the year. I put together yet another quilt this past week. I used the lattice design one more time to make a baby quilt for a friend. I need to get to the store to buy some binding fabric. I don't have anything that works in my stash. It's all quilted, and just needs finished up. I have quite a large stash of green fabric-- about twice as much as any other color. I started pulling fabrics the other evening to make an all green HST quilt, but I decided it needed a little bit more color. Here's a quick look at how far I am. I really like the springy colors. I think it will be a good project for January. One of my unwritten goals is to use my stash as much as possible. Every fabric came from my stash. We have one of the same resolutions, use more stash!! I love the colors of your spring quilt! Happy WIP Wednesday! I love the quilting on the baby quilt. The pink just pops!! That HST quilt looks great. You are right, the color added to the green really adds the right note to it! I love the quilting in WIP #1 and your WIP #2 looks similar to mine and I'm hoping to finish it soon! I love the triangles. So cheery! You're so good, Kati! I can't believe you may have 20 quilt finishes for the year. That's seriously so impressive (and definitely trumps my 9)! I can't remember if I asked you already, but do you press your HSTs seams open or to one side? 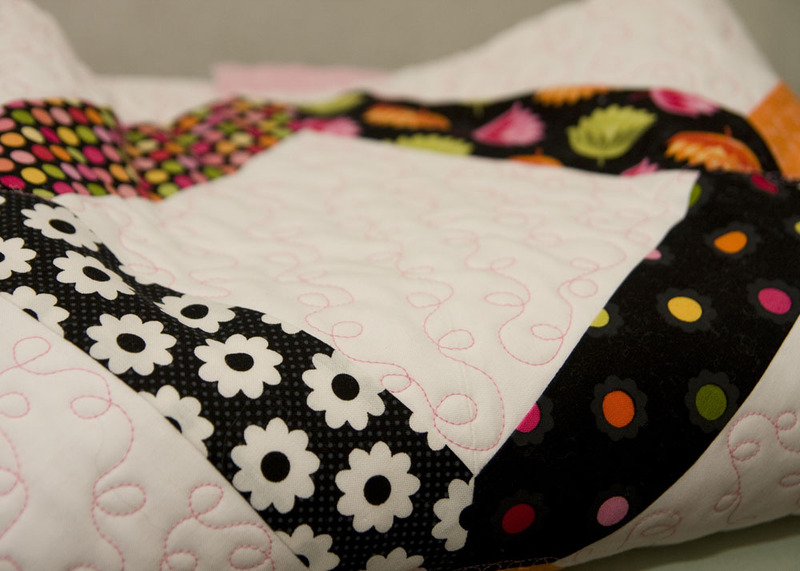 Oh my gosh I LOVE the quilting on your lattice quilt!! It's so perfect! Every time i try to do that it always gets so screwed up! And the hst quilt is to die for! love those colors! I so want to make one of those someday! Oh, I really like the HST quilt. Can't wait to see more! Loving your HST quilt! They are my newest addiction. Wow, ANOTHER finish before the new year? You are rocking it! Love the quilting on that one too. 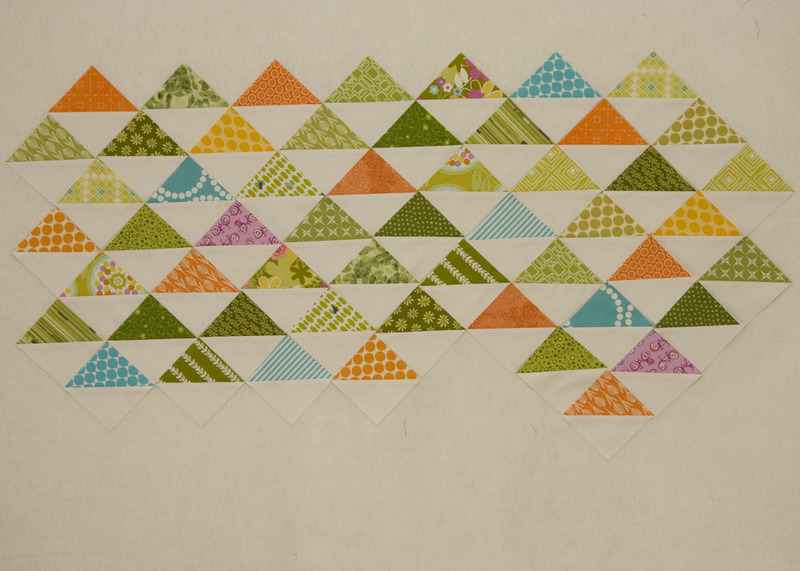 Super cute HSTs. I know, my stash is overwhelmed by both green and blue. And yet I have like ONE single purple print. Huh. 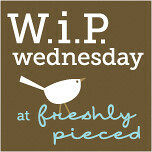 Thanks for linking up with WIP Wednesday! Have a great week! The pink is just too sweet that you used to quilt with on the baby quilt. Love it! your FMQ looks perfect! Do you have a stitch regulator? WIP #1 looks perfect!! I adore that quilting!! I noticed that when you put your favorites pictures up. When I gave them a squinty look, I saw more green. Seems like lots of the bloggers go on a fabric diet this time of year. Must be the thought of that after Christmas credit card bill coming.